This month in Oslo, an architecture student named Martin McSherry presented a controversial idea to a gathering of cemetery and funeral professionals. The topic? 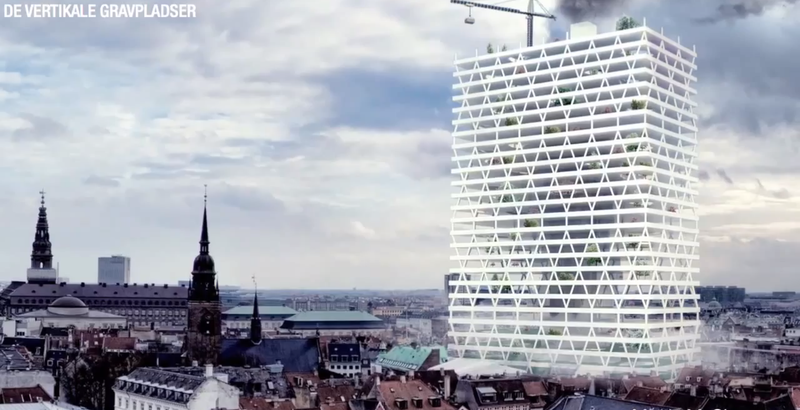 His design for a "vertical cemetery" that could, in theory, solve Norway's growing graveyard conundrum. In McSherry's vision for Oslo—which he presented at the Oslo Conference for Nordic Cemeteries and Graveyards—the dead would come to rest in a tall, airy skyscraper in the center of the city. It would start out as a simple white framework with an adjoining, permanent crane, which lifts coffins into slots inside the structure. The tower would grow over the years, as this crane would add more and more plots to the network—over time, the building would come to represent the sum of the city's citizens—a reminder and a memorial at the same time. "In time, the city's tallest and largest building will become a grave for all its citizens–the city's ever-changing monument," McSherry added. The precious land saved on the ground, in turn, would be used for parks and buildings for the living. The idea was met with a cacophony of protests—but also a few strong supporting voices. But why does the idea of a skyscraper burial seem to disturb so many people? First of all, it helps to know a bit about Norway's situation. Norway, like many land-scarce countries, practices grave recycling: Every citizen is allotted two decades in their spot before the land is reused for other bodies (your family can pay to preserve your space for longer, if they want). It's a practical solution—and it worked fine until World War II. That was when Norwegian law began requiring that bodies be buried inside of air-tight plastic wrappers—the thinking being that the tarps would prevent contamination of soil and water source. But when the first batch of graves were turned over for reuse, the bodies hadn't decomposed completely—thanks to the protection of the plastic. As a result, the country is quickly running out of spots to bury its citizens. There's even a cottage industry surrounding the conundrum: One graveyard worker will inject coffins from above with a limestone compound that accelerates decomposition for $670 per plot. That might seem expensive—but he's already treated 17,000 of them. Kjell Larsen Ostbye's underground lime injectors, via Rehabilitation of Grave Sites (PDF). And Norway isn't alone. As Baby Boomers reach old age, many countries are confronting similar crises. The BBC reported that England is on the brink of running out of burial plots, while some researchers have calculated that it will take a Las Vegas-sized piece of land to bury the 76 million people expected to die between 2024 and 2042. In an October op-ed in The New York Times, Christopher Coutts argued for America to adopt "unembalmed natural burial that allows cemetery plots to be reused after decomposition has occurred." There is nothing elegiac about a skyscraper: they're ambitious, lean, and busy. Many of us spend an entire life hustling from high rise to high rise; without wanting to sound too much like Alain de Botton, a change of scene is surely one of the more appealing aspects of crossing over. (It's apt that the memorial at Ground Zero is a pool, not a tower). Personally, I'd beg to differ that skyscrapers can't be elegiac (just look at Louis Sullivan's). In fact, cemetery designers in Israel and Brazil are already going vertical with stacked necropolis designs. And if you look far enough back into the cultural history of burial, you'll find that vertical grave sites are actually old news. The Mountain of the Dead. Image: AP/Kim Gamel. A necropolis in Italy. Image: AP Photo/Alessandra Tarantino. In Brazil, the Memorial Necropole Ecumenica has stacked the city's dead within its 32 stories of grave sites for 28 years. The development is the tallest cemetery in the world. But my guess is that Barker's disgust at vertical cemeteries is mostly cultural: We think of skyscrapers as our civilization's ant farms, buzzing with money, life, and striving in general. But thinking on a longer historical scale, it's hard to imagine a future where the trend towards urbanization—and thus skyscrapers—doesn't continue. As Alissa Walker argued today, the future is tall. That means there will be tall buildings that house not only offices and condos, but gyms, hospitals, community centers, parks, and—yes—cemeteries.